Locals walk through the Gold Ridge mine in 2003. The unraveling of a two-year old gold-mining venture in Solomon Islands, a Pacific Ocean nation named for the biblical king known for his wisdom and wealth, is burning bondholders. Australia’s St Barbara Ltd., which is seeking an exit from the Gold Ridge operation it acquired in 2012 in a $545 million takeover, has seen the value of its notes tumble to 79.75 cents on the dollar last week. More pain may loom: Standard & Poor’s pegs their value at just 30 cents to 50 cents on the dollar in the event of default. The odds of that happening are rising after defaults by compatriot miners Mirabela Nickel Ltd. and Midwest Vanadium Pty. in the past year. Metal producers globally are in retreat from a decade-long $616 billion investment spree in mines as supply gluts and muted Chinese demand weigh on prices. Miners have cut staff, slashed budgets and shut operations as gold slumped 28 percent in 2013, the biggest annual decline in more than three decades. Producers including the biggest gold miner Barrick Gold Corp. and Newcrest Mining Ltd. recorded at least $26 billion in writedowns last year. Bonds sold by global mining and metal producers have returned 3.6 percent this year and offered 511 basis points over Treasuries as of Aug. 29, according to the Bank of America Merrill Lynch U.S. High Yield Metals & Mining Index. That’s less than the 6.9 percent return for global corporate bonds, which have a yield premium of 109 basis points. Solomon Islands, which is three hours away by charter flight from Brisbane, is part of an archipelago named by Spanish navigator Alvaro de Mendana after the Israelite King Solomon, whose reign is described in the Bible as a period of great prosperity. The nation experienced unrest in the late 1990s and early 2000s prompting intervention by Australia, New Zealand and other neighboring countries to restore order. Tropical Cyclone Ita flooded an access road to the Gold Ridge mine in April, halting production. When staff returned in June to assess damage, hundreds of illegal miners had set up encampments, forcing Melbourne-based St Barbara to evacuate workers from the site. 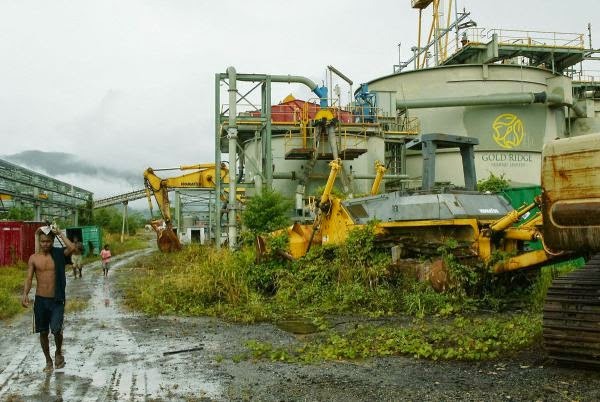 The Australian producer is negotiating with the Solomon Islands government to transfer control after booking pretax impairments of about A$280 million against the mine in the past two years, according to filings. The company’s $250 million of 8.875 percent notes due April 2018 fell to 79.75 cents on the dollar last month from 99.49 cents when they were issued in March 2013, according to Bloomberg prices. The yield has risen to 16.52 percent, or 15.3 percentage points more than Treasuries. St Barbara is rated Caa1 by Moody’s Investors Service, a grade it reserves for borrowers deemed to be in “poor standing.” (SBM) It has the highest risk of default among Australia’s junk-rated miners based on measures of liquidity, analyst Saranga Ranasinghe said by phone on Aug. 28. In a default, the bonds may have a recovery value of 30 to 50 percent, S&P estimated in March, and the company’s going-concern value may be as little as A$175 million to A$200 million. That hasn’t changed, analyst Brenda Wardlaw said by phone on Aug. 28. St Barbara’s cash fell 32 percent to A$79 million as of June 30 from a year earlier, according to its financial statement released Aug. 27. Its debt includes a $75 million loan at 8.5 percent interest from RK Mine Finance, payable over 33 months from end-February 2015. The lender has priority to claims over bondholders, according to S&P. The miner’s plight in the Pacific underscores the weak performance in Australia’s junk-rated miners. They returned 1.8 percent this year in the Bank of America’s Metals & Mining Index, while Canadian producers gained 9.9 percent. St Barbara’s two mines in Western Australia produced profits in the year ended June 2014, accounting for 75 percent of revenue of A$533.8 million, according to a Aug. 27 statement. High costs at the company’s Pacific operations, which include Gold Ridge and the Simberi mine in Papua New Guinea, dragged the producer to a net loss of A$500.8 million in the period, it said. The company is seeking to raise output at its Simberi mine to improve cash flow, Vassie said. “It’s on the right path to deliver cash and we have a very strong cash generating asset at Leonora” in Western Australia, he said by phone from Melbourne. “That gives us the confidence that we have stabilized the company, we haven’t defaulted on any payments and the big bond item is due only in 2018,” he said. Building cash flow is “critical” before debt repayment kicks in, Rob Craigie, an analyst in Melbourne at Baillieu Holst, said by phone on Aug. 27. That hinges on the operating performance at its mines in Western Australia and Papua New Guinea, gold prices and capital expenditure, he said. The Gold Ridge mine poured its first gold in August 1998 and was shuttered after two years. Then-owner Delta Gold Ltd. exited in June 2000, after which workshops and stores were vandalized. Allied Gold Ltd. bought the mine in 2009 before the company was taken over by St Barbara in September 2012. Investors may see more defaults in the industry as the cost of capital remains high for miners with weak balance sheets, Pengana Capital’s Ronge said.